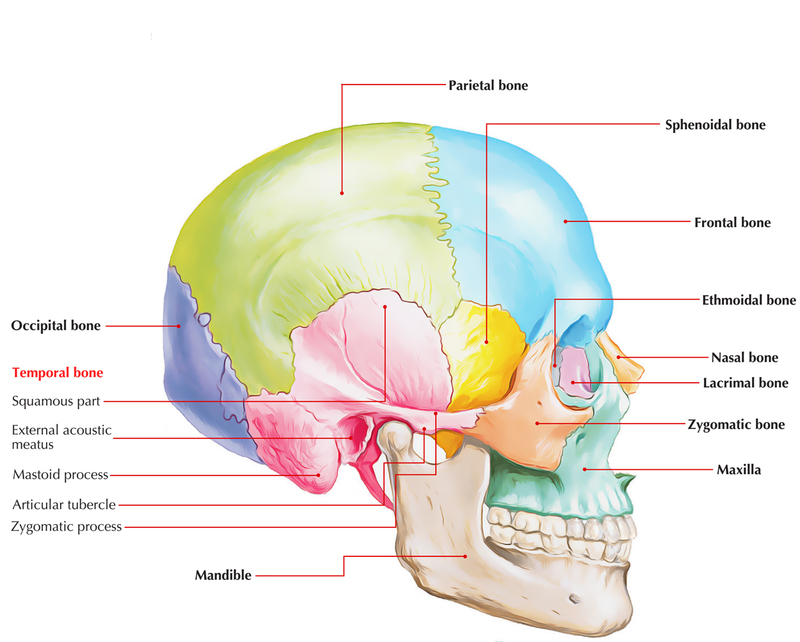 It is situated on every side in the base and side of the skull and is an uneven pneumatic bone. It projects upwards to create the side of the skull. It’s thin, translucent, shell-like plate of bone. It presents external and internal surfaces; and superior and anteroinferior border and zygomatic process. External surface creates the floor of temporal fossa and is grooved in its center by the middle temporal artery. The zygomatic process projects laterally from the lower and anterior parts of the temporal surface. To create the zygomatic arch it joins the temporal process of the zygomatic bone. A deep cavity behind the articular eminence is known as mandibular fossa. The mandibular fossa and articular tubercle are essential portions of the squamous part of the temporal bone. Internal surface is located in contact together with the temporal lobe of the brain. It’s grooved by the anterior and posterior branches of the middle meningeal artery. For the benefit of convenience of description, the petromastoid part is usually split into 2 parts: mastoid part and petrous part. 1. Petrous part: It’s the most challenging (rock like) part of the temporal bone and includes inside it: internal ear, middle ear and mastoid antrum, which it safely shields. It also includes carotid canal for internal carotid artery. The petrous part has a shape of a 3 dimensional pyramid. It’s a base, an apex, 3 surfaces and 3 edges. The base is fused with the squamous part. The apex creates the posterolateral wall of the foramen lacerum. Anterior surface creates the posterior part of the middle cranial fossa. It presents 5 features. Posterior surface creates the anterior wall of the posterior cranial fossa. It presents 3 features. Inferior surface is viewed in the base of the skull. It is located between the greater wing of sphenoid and basilar part of the occipital bone. It presents the lower opening of the carotid canal, jugular fossa, tympanic canaliculus and a triangular depression in front of the jugular fossa. The triangular depression in front of the jugular fossa lodges inferior ganglion of glossopharyngeal nerve. The apex of fossa presents an opening, which leads into a bony canal, the cochlear canaliculus that is traversed by aqueduct of cochlea/perilymphatic duct. Superior border: it’s a long sharp crest which intervenes between middle and posterior cranial fossae. It’s grooved by superior petrosal sinus. Its medial end is crossed by abducent nerve deep to petrosphenoid ligament (ligament of Gruber). Anterior border: its medial part articulates with greater wing of sphenoid and creates sulcus tubae on the undersurface of the base of the skull. Its lateral part joins squamous part at petrosquamosal suture. Posterior border: its medial part articulates with all the basilar part of the occipital bone and creates a groove which lodges the inferior petrosal sinus. Its lateral part creates the superolateral boundary of the jugular foramen. 2. Mastoid part: It is located below and behind the squamous part and includes mastoid antrum, which interacts with the middle ear cavity in the petrous part of the temporal bone. It finishes below as mastoid process. It encloses the mastoid air cells. On the medial side of the mastoid process there’s a notch referred to as digastric notch for connection to the posterior belly of digastric muscle. Mastoid air cells: The mastoid process is made up of cortex of compact bone using a honeycomb of air cells underneath it. The air cells are small intercommunicating spaces that are constant with the mastoid antrum and middle ear. Pneumatic or cellular mastoid process: In this, air cells are well-developed and the intervening septa are thin. Diploeic or miscellaneous process: The process is made of narrow spaces and few air cells. Sclerotic or acellular process: There are really no cells or narrow spaces in the mastoid process. The antrum is small and sigmoid sinus is interposed. Middle ear infections frequently spread into mastoid antrum and mastoid air cells to cause mastoiditis and mastoid abscess. It’s a thin bony projection of about 1 inch length. It goes downward and forward from the under surface of the tympanic plate. It’s crossed externally by the facial nerve. External acoustic meatus (bony part) opens on the surface behind the mandibular fossa below the posterior part of the posterior root of zygoma and creates about 2 third of the absolute length of the external auditory meatus. The suprameatal triangle (McEwen’s triangle) is a small depression posterosuperior to the external acoustic meatus. At birth, the tympanic cavity, tympanic membrane, mastoid antrum, ear ossicles and internal ear; all are of the mature size.